Based on reviews from 216,850 users. Learn how our rankings work or see our guide to Adidas low top sneakers. Updated Apr 2019. Low top shoes have been the go-to footwear of many people ever since rubber-soled sneakers were invented. The comfort and style that this type of shoe offered seem to be unrivaled. Low top kicks are also highly versatile and have transitioned from sports to daily casual wear. Many people favor low top Adidas kicks for their daily use. This is because the brand's footwear features a balance between sports and style, which means good looks and performance in equal measure. Adidas also offers a wide range of styles and colorways, such as black, red, blue, white, or any classic or unique combination. There are many low top shoes in the Adidas lifestyle catalog, which is why it would be difficult to compile a list of Adidas top ten low shoes. Some are tennis-inspired, such as the Adidas Lacombe SPZL, or taken from basketball, such as the Adidas Tubular Radial. The brand is fond of taking inspiration from its heritage styles, or of transitioning existing models into lifestyle use. Listed here are the most popular Adidas low top sneakers, grouped according to the sport or category where they are inspired from. With the advent of athleisure, sports sneakers have transitioned intro casual wear. Running kicks are a favorite inspiration for many lifestyle shoes. This is because they offer much support, and the designs are suitable for a sporty casual flair. The following are the best low top Adidas sneakers that are running-inspired. The Adidas ZX series was introduced in the 1980s, featuring innovative running shoes. In 2014, another model was added to the line, the Adidas ZX Flux, which balances a street-ready design with features for performance. A year later, the ZX Flux Xeno was introduced, inspired by the iridescent scales of the Xenopeltis snake. Torsion technology is used by this shoe to provide excellent arch support along with flexibility for the forefoot and heel. It retailed at an affordable $120 price tag. Men’s 6.5-13 and women’s 5-11 are available. It is said to run large. Another worthy low top model from the ZX line is the Adidas ZX 500 RM. First issued in 1991, the Ultra Tech is part of Adidas’ collection of iconic kicks. Between 2013 and 2014, the brand re-released the model, pulling it from the archive once again for a retro edition in 2018. 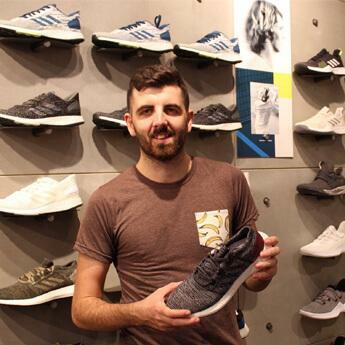 The sneaker’s original running shoe details were retained, as Adidas was looking to enter the running footwear trend in the lifestyle category. These retro low top Adidas shoes feature the brand’s heritage web-covered midsole design. At $120, this shoe is reasonably priced. Available sizes are in men’s 3.5-14 and women’s 5-10. In 2017, the Chinese New Year Celebratory Pack was released in celebration of the Year of the Rooster. It consisted of Adidas Originals low top sneakers, such as the EQT Support Ultra CNY, which combined the original’s upper design with a Boost midsole. Chinese New Year details are found all over the shoe. The design of this sneaker took inspiration from the Mahjong rooster tile, which is found on the sock liner and heel. This limited-edition model was sold at an ultra-expensive price of $255. 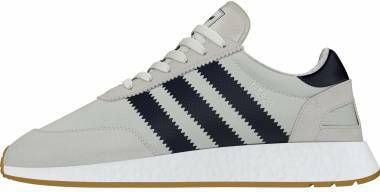 Men’s sizes from 7-13 were issued for these Adidas Originals low top sneakers. In the past, basketball shoes featured high-cut collars for ankle protection and support. As time went by, low top designs were introduced in the sport. Due to the popularity of basketball, fans want to wear their favorite players’ shoes. This is why basketball-inspired kicks are so popular. Below are some of the popular models in the category. The Adidas Superstar is one of the most iconic sneaker silhouettes of all time. It’s also among the top ten low Adidas shoes. Introduced in 1969 as a basketball shoe, it enjoyed popularity throughout the 1970s. People took to calling it “shell toes” or “shell tops” due to its unique rubber shell toe design. One of its versions is the Superstar Suede, which upgrades the leather upper to suede for a classic style. Other notable Adidas low top sneakers from the Superstar line include the Adidas Superstar 80s, Adidas Superstar Slip-On, Adidas Superstar Bounce, Adidas Superstar Metal Toe, and the Adidas Superstar Boost. These retro low top Adidas shoes have a budget-friendly $85 price point. Sizes are in men’s 6-13 and women’s 5-11. The sneaker was described by some as small and narrow, especially for those who have wide feet. 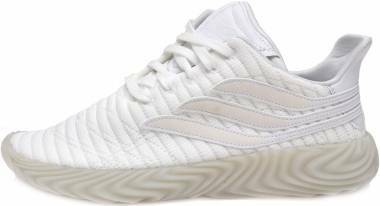 From the NEO lifestyle line, the Adidas Daily has a basketball silhouette that’s been revamped to make it suitable for everyday use, hence the name. With its youthful and sleek appeal, it could offer a fresh twist to any outfit. It’s also low-key and simple enough to be versatile, appropriate for dressing up or down. Its outsole is made up of vulcanized rubber with pivot points. The Cloudfoam sock liner delivers comfort and cushioning. It has a budget-friendly price of $65. Men’s 6-12 sizes can be found. The shoe is reputed to run narrow. Its second iteration, the Adidas Daily 2.0, is also a popular shoe. The Adidas Baseline is another offering from the Adidas NEO collection. It has a clean and classic appeal, featuring a luxurious vibe that will not look out of place on the streets or at any occasion. The iconic Three Stripes on the lateral sides add a sporty touch on an otherwise low-profile model. Stitch detailing on the vamp adds a stylish accent, enhancing support at the same time. It’s a budget-friendly shoe, retailing at $60. These Adidas low top sneakers have been revealed to run large, so one size down is recommended. Men’s 7-14 and women’s 5-12 are offered. Like many footwear brands, Adidas has a skateboarding line, featuring apparel and shoes that are made just for the sport. Skateboarding kicks are made to be durable to withstand the wear and tear that comes with the demanding moves of skating. They are also supportive and street-ready, reflecting the styles of urban skaters. Here are some skate-inspired Adidas low top sneakers that are meant for casual use. This sneaker was released in 2016 and was meant to be a tribute to the classic court shoe from the Adidas archives. With its timeless silhouette and elegant appeal, this model is built to take on the streets in style. This model also features an extra-thick rubber toe cap, which adds durability and helps skaters in pulling off flip tricks, offering style and performance. Another popular iteration of this sneaker is the Adidas Matchcourt ADV. It has a budget-friendly $70 price tag. It’s offered in men’s sizes, ranging from 6-14. The shoe fits true to size. This shoe has a sleek profile and a double layer of foxing tape around the toe for an extra-durable structure and support for such tricks as high jumps and flips. It’s another budget-friendly option at $70. The sneaker has been confirmed to fit as expected. Men’s sizes can be found, ranging from 6-14. Built as a soccer shoe for cold wear, the Adidas Samba was first released in the 1950s. It has been included among the Adidas top ten low shoes. The brand rebuilt the sneaker for skateboarding almost 65 years later, this time called the Samba ADV. Iconic details such as the timeless tan gum sole remain, making this model well-suited for the modern age of retro style. The sneaker’s heel clip is made up of molded Thermoplastic Polyurethane, which provides enhanced support for skating. It has a budget-friendly retail price of $75. With a true-to-size fit, this shoe is available in men’s sizes from 6-14. Tennis has long been a sophisticated sport, from the elegance of the all-white outfits down to the smooth good looks of the sneakers. This is why tennis kicks have become favorites for casual wear, especially as they transitioned into preppy fashion. 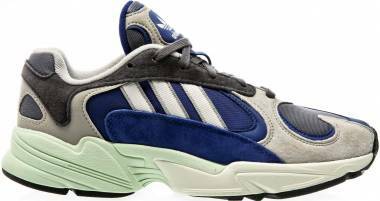 The following are some of the low top Adidas shoes inspired by tennis. Exclusively released in Japan in the 1980s, the Adidas 350 was re-introduced in 2016 during the much-awaited Adidas Spezial show. The original model’s design was retained but updated with a premium leather upper for a sophisticated and modern take. After the success of the release, the shoe was then issued in more colorways and offered on a wider market in 2017. 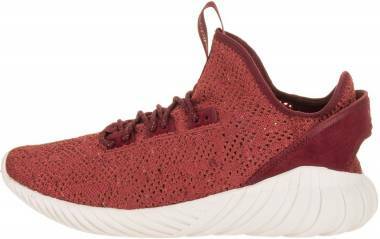 Synthetic lining, a cushioned insole, and a lightly padded collar all add to the comfort of this sneaker. These Adidas low top sneakers were released at a budget-friendly price of $80. With a generally true-to-size fit, this model was issued in men’s sizes from 4-14. The Adidas Stan Smith was previously known as the Adidas Robert Haillet for the 1960s French tennis professional player. A few years after Haillet retired, Adidas renamed it the Stan Smith in 1971 after the American tennis player of the same name. Since then, it has turned out to be one of the most iconic kicks of all time, loved for its simple appeal and timeless style. Additionally, it’s one of the top ten low Adidas shoes. Another notable iteration of this shoe is the Adidas Stan Smith Mid. It remains a budget-friendly sneaker at its $75 price. This model is often tagged as unisex, but it is listed in men’s sizes, ranging from 4.5-20. Women can get their size by going down by 1.5. A signature tennis sneaker inspired the design of the Adidas Court Vantage. Minimalists would love this shoe, with its clean lines and straightforward style. The lightweight silhouette is done in canvas, delivering comfort with each step. This versatile sneaker could be a valuable addition to anyone’s lifestyle collection. Reliable yet low-profile traction and durability are provided by the vulcanized rubber outsole. At $60, this model is budget-friendly. The sizes offered are in men’s 4-14 and women’s 4-10.5. It is said to run large. Training kicks are constructed with much support and flexibility. A lot of them are also meant to be used indoors. Over the years, training footwear has transitioned into daily casual wear due to their functionality. 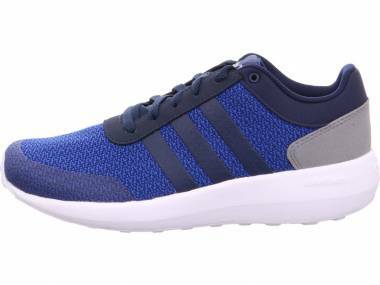 The following are some popular Adidas low top sneakers that have training-inspired designs. No list of legendary Adidas kicks would be complete without the Adidas Gazelle. First released in 1966, this performance training shoe continues to be a crowd favorite, worn by many men and women. It was the first Adidas sneaker to have a suede upper, with a classic design that has proven to be timeless and versatile. Other popular versions of this model include the Adidas Gazelle Primeknit, Adidas Gazelle Cutout, and Adidas Gazelle Stitch and Turn. It has a budget-friendly $80 price point. Sizes are in men’s 6-14. Women should go a size and a half down for a proper fit. This shoe is named after the Bavarian capital Munich, one of the beautiful cities of Germany. It was introduced in 1979 as training footwear that’s meant to be used indoors. The sneaker developed a cult following, including in German communities, but it was taken off the shelves for many years. Its highly successful comeback in 2016 proves just how much the model was missed. This shoe is part of the Adidas City Series, which includes kicks named after such cities as Berlin, Copenhagen, Zurich, and London. With a price tag of $90, these Adidas low top sneakers are budget-friendly. It can be found in men’s sizes, ranging from 4.5-13.5, with a true-to-size fit. The Adidas BW Army, which stands for Bundeswehr or “Armed Forces,” was initially made as a military training shoe. It was issued in the 1970s and has inspired many other iconic models, such as the Samba and Gazelle. Adidas re-introduced the sneaker is 2017, keeping the original style while updating it with a few modern touches. Leather and suede overlays make up the upper of this formerly indoor training footwear. It’s an affordable shoe with a $100 price tag. This sneaker has been found to run small. It can be found in men’s 4-14, while women can get their size by going one and a half size down. With the demands of hiking, footwear in this category are built to last. Hiking shoes are also primed with superior traction for different terrains, as well as constructed with waterproof and durable designs to enable the wearer to face the elements. As fashion trends gravitated towards stylish winter wear, hiking became a favorite inspiration for lifestyle sneakers. Here’s one example of one such shoe. The Adidas Seeulater was introduced in the 1990s. It was made as ankle boot with a wool material, built for the winter months. In 2017, the model was updated as the Adidas Seeulater Primeknit Winter. It was engineered for the cold months, featuring an insulated upper and waterproof membrane. Among this model’s original colorways are Magenta and Royal. At $175, this is considered a premium-priced sneaker. Men’s 4-14 and women’s 3.5-12 are available for this shoe. It fits as expected. 1. How does one style Adidas low top sneakers? Low top kicks are some of the most versatile footwear that one could wear for daily activities. Depending on the style, Adidas low top shoes can be styled in plenty of ways. Below are some styling tips to take note of. For men, low top kicks from Adidas are best paired with jeans or shorts for any casual day. Sporty clothes such as joggers and track pants would also be great. Simple t-shirts would do for an urban appeal. 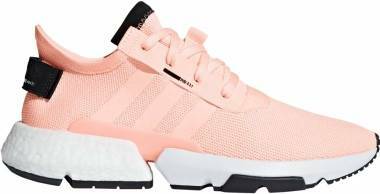 Ladies have many options when it comes to styling low top footwear from Adidas. Skirts, shorts, and jeans are favorite pieces for casual chic flair. For a preppy look, skater skirts or dresses would achieve a sophisticated touch. 2. Where could one buy low top Adidas kicks? Adidas has plenty of retail stores and outlets where one could buy a pair of low top shoes. Additionally, the brand’s products are sold in many department stores. 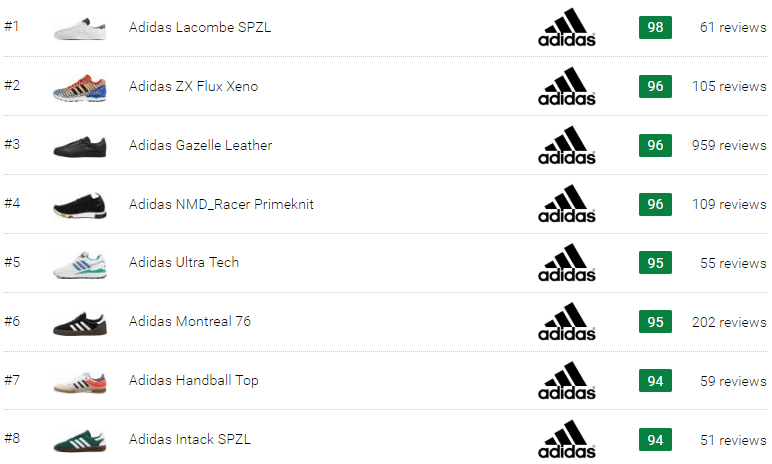 Adidas also sells its models online through their website. Other online retailers also stock the brand’s kicks, along with resellers. 3. 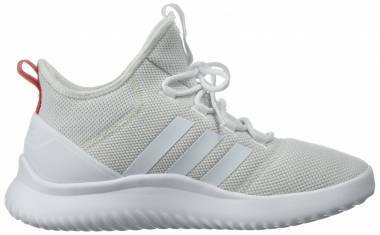 What is the price range of Adidas shoes that have a low top design? 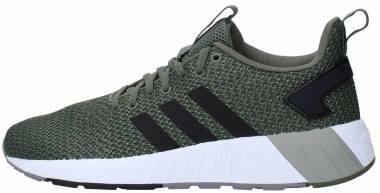 Adidas offers a variety of sneakers in different price ranges. There are budget-friendly models, ranging from $75 to $90, while affordable kicks could be found up to $120. 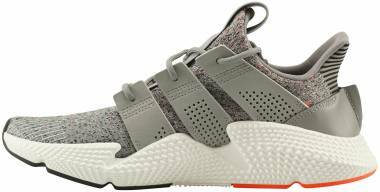 The brand also offers ultra-expensive low top kicks, such as the Adidas EQT Support Ultra CNY, which retails for $255. 4. 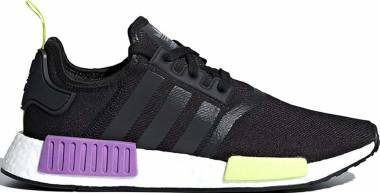 How much support do low top Adidas shoes offer? Adidas low top footwear varies when it comes to the support offered. However, the brand has been known for its innovations, especially when it comes to comfort and cushioning. This is why many low top options from the brand's catalog are praised for the support that they offer. Although low top kicks don't provide as much ankle support as high top designs, the ankle is left to move spontaneously. 5. 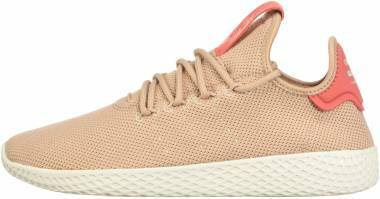 Where are low top Adidas models made? To know where a shoe was made, look at the tongue label, which usually bears the “Made in..” information. As a global brand, Adidas has many factories around the world where the shoes are manufactured. The brand continually updates its lists of factories and suppliers, which names factories in such countries as China, India, Indonesia, Vietnam, Japan, Korea, and more. 6. How durable is Adidas low top footwear? The durability of low top models depends on their materials and construction. Adidas low top sneakers that are made of leather or suede are known for providing durable structures. Those with canvas or mesh uppers offer much flexibility and are also known for their dependable feel. 7. How could one properly clean Adidas low top shoes? Adidas has laid out cleaning instructions on how to properly clean sneakers, including low top models. Below are the steps. A soft brush or old toothbrush can be used to scrub away dirt, especially from the soles. Mix a mild detergent with lukewarm water to make a solution. Dip a washcloth in the mixture and gently wipe away stains. For the next step, dip the washcloth in lukewarm water to get rid of excess soap and dirt. A soft brush could also be used. Finally, the shoe must be dried at room temperature. For leather sneakers, a conditioning treatment could be applied. Meanwhile, shoelaces and removable insoles could be put inside a pillowcase to be machine washed with detergent. It must be set to cold or delicate wash.
8. What is the fit and sizing of Adidas low top kicks? 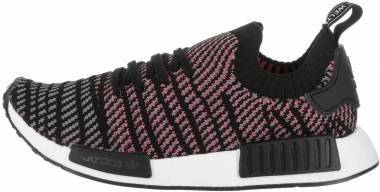 Adidas sneaker sizes usually range from 5-12 in women's sizes and 6-15 in men's sizes. The fit would depend on the model, as some shoes run small or large, while others also have a narrow or wide width. 9. Do low top Adidas sneakers offer ankle protection? High top shoes are often touted as the best for ankle protection. However, there has been no conclusive evidence that they prevent injuries. As such, it may all be down to the preference and comfort of the wearer. High tops offer a more enclosed feeling, keeping the ankle secure. Meanwhile, Adidas low tops let the ankle move freely. 10. How could one maintain the look and shape of Adidas low top footwear? Shoes look wonderful when they’re spanking new. However, it’s inevitable that they would develop wears and tears as one continues to wear them. To prevent that from happening too fast, here are a few steps that will help in maintaining the look of Adidas low top shoes. Shoes could be sprayed with a waterproof protector so that they don’t sustain any damage if they get wet outdoors. It’s always a good idea to alternately wear different pairs of sneakers. This way, the kicks won't get worn out too quickly. After wearing a pair, let the shoes out in the open area first before storing them in the closet. This will help air them out and get rid of any odors. Use shoe trees to keep the shape of the sneaker. These devices could be easily bought at shoe stores or footwear repair services. For Adidas low top shoes in leather, make sure to polish them with the right leather liquid polish to keep them looking shiny instead of dulled by wear.